This stunning gown from Elle Zeitoune perfects the balance between the classic and the modern. 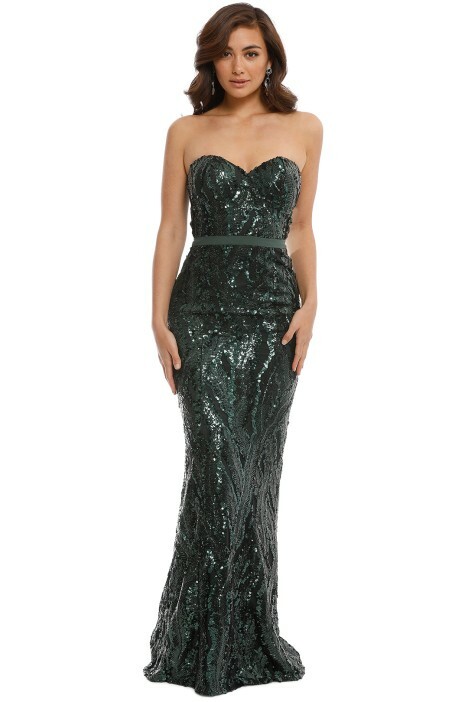 With a timeless, flattering shape – a strapless sweetheart neckline, cinched waist and form-flattering skirt – offset by gorgeous emerald green sequins, this dress is bound to impress. 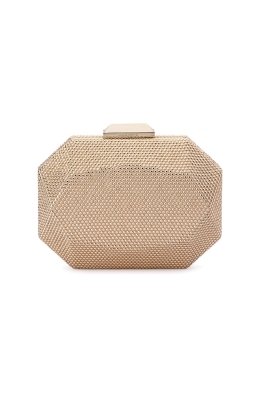 Flattering the décolletage and hugging the figure, this is the perfect combination of elegance and glamour! We love this gorgeous emerald gown for a hint of Hollywood glamour. Perfect to hire for formals and evening occasions. 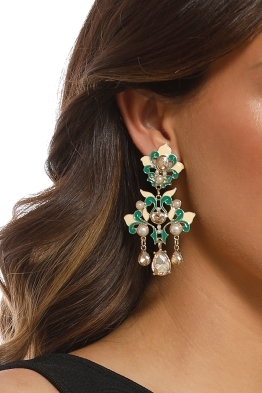 Pair with diamante teardrop earrings for extra sparkle. For more outfit inspiration read our hollywood glamour dress hire customer story. BUST: This dress is suitable for most bust sizes, however due to the inbuilt cups, women with larger cup sizes should consider trying a size up as a backup order. UNDERGARMENTS: We recommend wearing shapewear to minimise lines, and a strapless bra. FABRIC: The fabric has no stretch, and is fully lined. GREAT FOR: Voluptuous, hourglass, pear shaped, straight body types. Gina Gown - Emerald is rated 4.7 out of 5 by 26. Rated 5 out of 5 by Shirley from Perfect ball gown I rented this last minute for a black tie event and received so many compliments! It luckily fit me well but have to say it is a tight fit, and very long. I and normally a size 6-8 and ordered the size 8, which just fit me around my hips. I will definitely be ordering from GlamCorner again, so easy and fuss free! Rated 5 out of 5 by sam from Show stopper dress! I wore this to a charity event, loads of comments on the colour and style. Rated 5 out of 5 by Alex from Beautiful dress for a Black Tie Event I rented this over the weekend and OMG it was stunning! The fit was perfect for my body and was very mermaid like. Rated 5 out of 5 by Kristi from HSV Car Club Ball This dress is truly stunning and was commented on all night. I would highly suggest ordering the back up in this style as the size 10 was extremely tight around the hips, lucky I ordered the 12 as well. This was my first time ordering and it was so easy , will def order again . Rated 5 out of 5 by Linda from Awesome ball grown I rented this dress to attend a charity ball and received sooooo many compliments. It felt and looked amazing, the colour was just gorgeous. The whole process was so quick and easy, I would definitely use this service again and again and again. I'm normally a size 8 but couldn't even get the 8 over my thighs! Luckily I got a back up size 10 which fit but was still quite tight around the thighs. Rated 5 out of 5 by Andree from Perfect Charity Ball dress I rented this for a charity ball on the weekend and felt a million dollars. The dress was even more lovely in real life and the colour is stunning. It is quite long so I would recommend for ladies over about 168cm. I’m shorter than that and had to wear super high heels. I also agree with the other comments about it being quite snug on the hips. I am a size 8 in most things but I could only fit into the size 10 in this dress around the hips. As a result the bust area was a little large and I had to wear a very padded strapless bra. I’m glad I ordered the size 8 and then size 10 as a back up dress and would recommend to anyone unsure of their exact measurements to do the same. Rated 5 out of 5 by Bec from Black tie ball I rented this dress last weekend and loved it! Got the size 12 which was perfect except a little big around chest. I’m a size c.